Two colors have stand out from runways this season; navy blue and burgundy. It seems to me that each year we are able to find a few articles in navy blue as it is a classic autumn/winter color, although there are more options this year. For that reason I decided to focus on the color burgundy because this color is more original and more difficult to find usually. bright colors (like pink, red, yellow etc…) and stick with neutral colors as white, black, grey, brown or beige. But this is a tip not a foolproof rule as it also depends on the fabric or style of each item. The complicated way but also the most original would be to pair it with printed patterns items that contain neutral colors. If you have issues paring your outfits I would advise you to avoid trying to match that color as I think that it is the most difficult to match. To be honest it is "a case-by-case". It does not mean that you can’t wear this color as you could also pick a dress in that case you just need to pick your shoes. 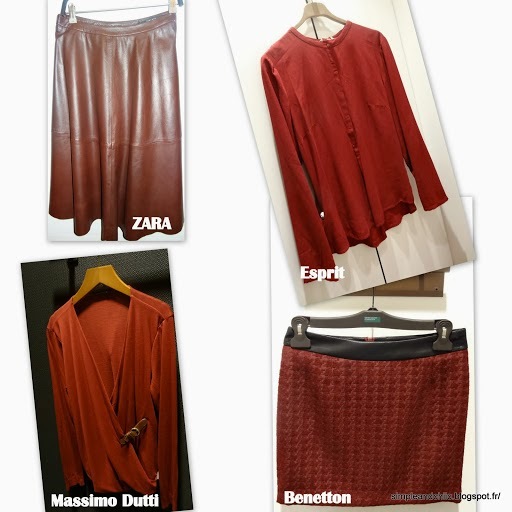 Now, my favorite item from above is the one from Massimo Dutti. For an everyday look I would pair it with a simple pair of jeans and fashionable dark (brown or black) snickers. I love mixing styles and in this case the pair of jeans would give a casual look whereas the top gives a more sophisticated one. For an an overall sophisticated look I would wear this top with a black skinny pair of trousers or jeans and riding boots. Finally for work I would pick a nice grey or beige long pant suit bottom to pair with brown shoes. For each look I would pick a big brown purse.